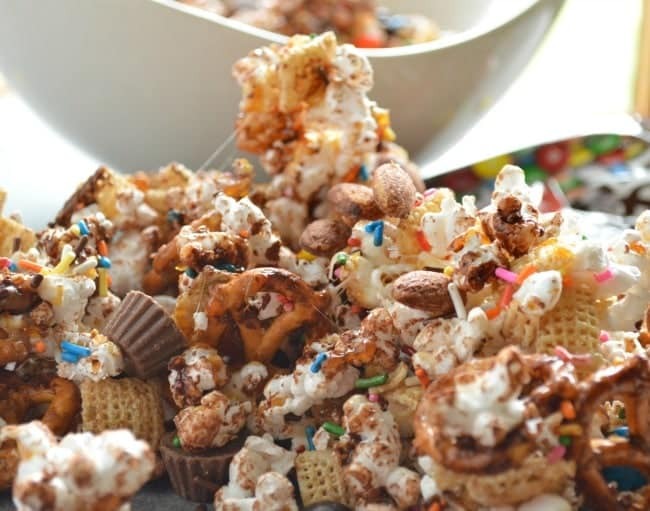 This Loaded Candy Bar Popcorn Recipe is full of pretzels, chocolate, marshmallows, M & M’s, Reese’s minis, caramel, and sprinkles! The ultimate in snacks. Oh hullo there, Best Snack Ever. All my binge TV watching has been waiting for you! Loaded Candy bar Popcorn, also known as Everything But My Kitchen Sink Popcorn, also known as This Is Basically All I Ate Yesterday Popcorn. After I took these photos and told my boys to have at it, Andrew professed, “I love our house. It is the best,” while Evan nodded in agreement with his cheeks stuffed full of popcorn and candy. I tossed together popcorn, Rice Chex, and pretzel twists. Then I made some quick caramel and drizzled it over the mix, tossing to coat. So far it is basically my Caramel Popcorn Pretzel Snack, right? (P.S. that is also an excellent choice) But then!!! I melted some marshmallows a la Rice Krispies Treat style. And THEN. I melted some dark chocolate; into the bowl it went. 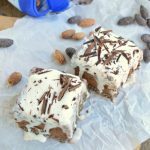 After that I raided the cabinets and added Salted Caramel Almonds (what?! I know. 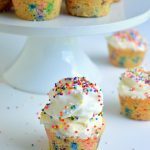 ), M & M’s, Reese’s minis, and a whole bunch of sprinkles. You can really throw in whatever you want. Raisinets? Do it. Rolos? Okay! Peanut M & M’s? Of course. It is also worth noting that this snack will totally make your kids love you more. AND! It is completely dangerous. I could not back away from the popcorn snack. The most indulgent popcorn! Loaded with caramel, marshmallow, chocolate, candy pieces, and sprinkles. 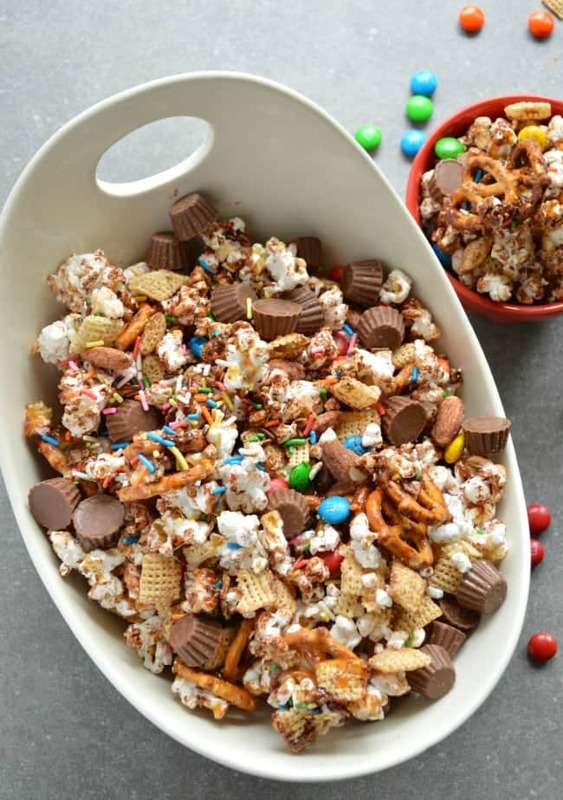 In a really big bowl (you'll need room to turn the mixture to evenly coat everything with each addition) toss together the popcorn, Rice Chex, and pretzels. To make the caramel, pour the water in a small saucepan. Pour the sugar right in the center in a pile (it will come above the surface of the water), and bring it to a simmer over medium high heat. Reduce the heat to medium and let the caramel cook for about 5 minutes, keeping a close eye on it. It will thicken and then turn that pretty amber color you recognize in caramel. Remove it immediately from the heat and place it in the sink. Stir in the milk or cream until smooth. It will fizz and bubble - just keep stirring. 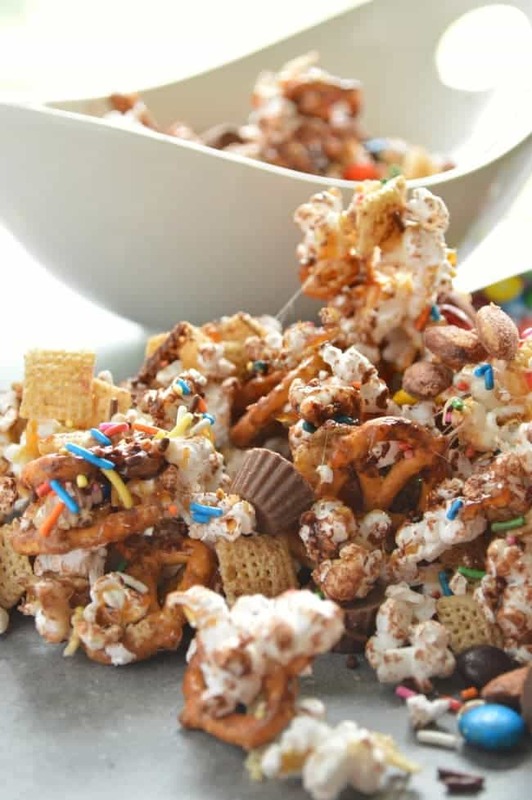 Drizzle the caramel over the popcorn mixture and toss to coat. Sprinkle the popcorn with the salt. To make the marshmallow mixture, melt the butter in a medium saucepan. Stir in the mini marshmallows and cook over medium heat, stirring almost constantly, until the marshmallows have melted. Pour the marshmallow mixture over the popcorn and toss to coat. Mel the chocolate and drizzle it over the popcorn. Toss again. 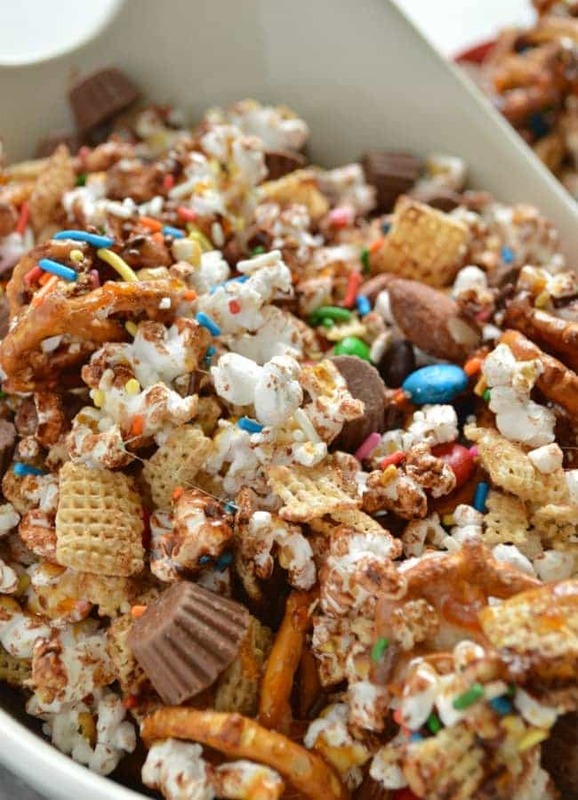 You WILL have big clumps of snack mix stuck together. Don't be afraid to break them apart. And definitely leave some stuck together! Once the caramel and marshmallows and chocolate have cooled and set up, stir in the M & M's, Salted Caramel Almonds, Reese's minis, and sprinkles. OK this is so fun! I need this in my life! 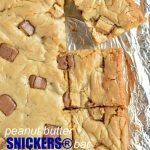 Adding peanut butter M&M’s would be yummy! Am I too old to be adopted into your family? Because if this is the kind of thing that happens regularly, I want in. Thank you for helping out with Popcorn Week, Heather! It’s totally a regular thing. And you can definitely be adopted. I’m the only girl over here and need to recruit anyway. I totally wish that I had this at my house right this second because I’d easily take down a bowl of it. I love the addition of all the candies to it and the salty-sweet thing you’ve got going. (That’s one of my favorite combos!) We’ll definitely be making this soon, and I am so stupid excited about it. Also? 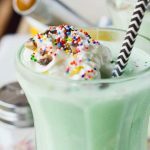 I’m going to get a stomachache trying all the Popcorn Week recipes, and I don’t even care because they all look soooooo good. Erin we are in the same boat! Bout to make myself sick on popcorn and don’t even care. Oh my that popcorn looks beyond delicious. I would love some now. I am so addicted to popcorn, and this is perfect for movie night tonight.